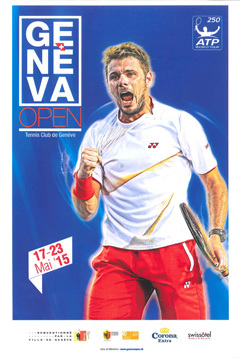 The final week on the ATP tour before the 2015 French Open in Paris will feature a pair of clay 250 level tournaments. Nice in France is back yet again with its intimate venue, and Geneva is making it’s debut on tour this year as well. The Swiss city previously hosted a quality, and successful challenger tournament, and with the success of Swiss tennis over the last decade, it’s a well deserved promotion as it takes the place of Dusseldorf, Germany on the calendar. Dusseldorf met it’s demise soon after the World Team Cup format came to an end. With a seed cutoff of 36 Nice has a pretty good field for a pre-slam tournament, that said, the top 4 seeds are either poor on clay or slumping, so unseeded players will have a great chance this week to excel. Both of these guys are streaky players who were formerly near the top of the ATP tour, but have slid down to being fringe to mid-tier ATP players who rarely threaten for titles, even in 250 level events. Monaco, the veteran has encountered some tough draws in the spring clay court season and thus his record stands at an even 4-4. Paire is 3-3 in main draws this spring on clay, and has bounced around qualifying as well. They have an even 1-1 h2h on clay with both matches going three sets, and any way you slice it, this is a tough match to predict. That said, Monaco seems to be the superior player in form and focus over Paire as of late, and thus he’s the favorite. Paire is likely to produce more highlights, but Monaco has the steadier groundstroke game. Estrella rolled past Thiem in straights when they met in Barcelona not too long ago, and now we will see if he can repeat that result in Nice. Thiem has been improving over his past two tournaments going 4-2 in Rome and Munich, after consecutive losses to start the European spring clay court season. The Austrian has had a streaky and unpredictable year, and it’s still a question as to what type of form he will show up to this tournament in. The remarkable veteran Estrella has far less upside than Thiem but he’s maximized the talent he does have as he’s also 4-2 over his last six on clay with a win over Marin Cilic his most notable in that span. Once again, this is a 50/50 proposition, but I’d give Thiem the slightest of edges to advance if he continues to play as he did in Rome. Gilles Simon, the top seed, and a home favorite, is likely to get his tournament started against Thanasi Kokkinakis, as the young Aussie should dispatch his countryman James Duckworth, an opponent who struggles on clay. Kokkinakis has been on a relative roll on clay this Spring, with strong under the radar performances. The teenager is currently in the final of the Bordeaux Challenger and he qualified in both Istanbul and Madrid, all of those tournaments on clay of course. That said, he should be too fatigued to give Simon much of a problem, and thus expect the Frenchman to at least reach the quarters presuming his health has returned to him after retiring in Rome. Bernard Tomic and Borna Coric will vie for supremacy in the section below Simon, with the Croat the likely quarterfinalist. Both will open with qualifiers as Tomic looks to snap a four match losing streak. The Aussie has cooled off after a strong start to the season, though that had to be expected given he’s not at his best on clay, while Coric continues to build up results as a young gun, and he should reach his second clay quarterfinal of the season (also did so in Estoril), with wins over a qualifier and Tomic. Presuming he faces and defeats Tomic, that would avenge his loss to him in Indian Wells on hard court this year. I’m picking Coric over Simon to reach the semis, Simon retired in his last match in Rome, and Coric took a set off of him on indoor hard in Marseille this year. Clay should give Borna a slight edge and Simon may not be fit after a so-so spring clay season. The partisan French crowd should be rooting for young gun Lucas Pouille, a potential dark horse in the draw, to give the 4 seed Leonardo Mayer a whipping in the second round. Pouille will open with American Tim Smyczek, who is not comfortable on clay, and should he upset Mayer, he would be grabbing the spotlight after last making waves in January where he reached his first ATP semi in Auckland. The Frenchman has put together a solid clay court record this spring on a mix of challenger and ATP events, and he notably defeated Dominic Thiem in Monte Carlo. Mayer is just 3-4 on clay this Spring, and I have Pouille notching the upset to reach the quarterfinals. The winner of Paire/Monaco is the likely quarterfinalist in the last section on the top half, Sam Querrey/qualifier are not an imposing second round opponent, and I’d also favor Monaco over Pouille to reach the semis. Juan dispatched Pouille at the French last year without dropping a set. John Isner may well face Steve Johnson again, if the American can beat a qualifier. Isner beat Johnson 4 and 4 in Monte Carlo this year and given he’s 7-4 on clay this year and Johnson is just 2-4, he has the decided edge to reach the quarters. He could well face American Jack Sock in that quarterfinal, if Jack continues to compete hard and impress. He’ll need a revenge win over Dusan Lajovic, who he lost to at the French last year, in the opening round, but the Houston champ, who has lost a pair of tough matches in a row to solid clay court players Jo-Wilfried Tsonga, and Simon, should be the favorite to do that given Lajovic, though he qualified in Rome, hasn’t done much on clay this year. The winner of Maxime Hamou, a French wild card, vs. Pablo Carreno Busta will decide who the winner of Sock/Lajovic will face. The 19 year old Hamou recently reached a challenger semi, and he’s also scored himself a Roland Garros main draw wild card while PCB was a semifinalist in Estoril, but has been abysmal most of this season. I’d give Hamou a chance, but Sock should beat Lajovic and PCB to reach the quarters. Isner has beaten Sock twice on clay, including in Nice last year, and given the 4-1 h2h I’m pretty comfortable picking the higher ranked American to reach the semis, even though a Sock win wouldn’t come as shock. It’s more than likely the defending champion Ernests Gulbis will see his hopes continue to be dashed, this time Gulbis is likely to lose to Alex Dolgopolov in the second round, presuming Dolgo beats his countryman Sergiy Stakhovsky. They have a split 2-2 h2h and Dolgo qualified and won a round in Rome, while Stako has been struggling. Gulbis is 2-1 in the h2h, with all of their matches on clay against Dolgopolov, and both are unpredictable but Gulbis has been having one of the worst seasons for a top 20 player in recent memory as he’s on another 5 match losing streak and is just 1-11 this year. Going back to the challenger tour still seems like the wisest option for the Latvian. The section above Dolgopolov/Gulbis is the strongest in the draw as it features title contenders Estrella/Thiem, and also Nick Kyrgios, who will open with Mikhail Kukushkin. Kyrgios has had an extremely impressive clay court season with an ATP final, success in doubles in Rome, and a win over Federer in Madrid. That said I see a Thiem-Dolgopolov quarterfinal, as I’m unsure Kyrgios can sustain his success against the Thiem/Estrella winner. I’m going with a Thiem-Isner semifinal, simply because I trust an in-form Dom on clay more than anyone else in this section Should he fail to perform however, Estrella, Kyrgios, or Dolgo should pick up the slack and reach the semis. He’s in the weaker top half of the draw with a questionable Simon, and a struggling Tomic thus he can very well reach the semis, and his semifinal opponent is unlikely to be that daunting of a challenge whether it’s Mayer/Pouille or Monaco/Paire. He has a solid shot at winning his first ATP title this week, and the young gun clearly has the game to do it presuming he can put it all together this week. I’m picking Monaco simply because I feel he’s played slightly better on clay as of late, and the same goes for Isner. A reverse result wouldn’t surprise me at all, but Isner, has shockingly put together the best clay court season of anyone in this tournament. Isner and Monaco have met twice on clay before with a split h2h, and going back to what I said previously, Isner has actually been best on clay of anyone in this tournament, thus I shockingly have an American winning a title on clay in Europe this week. Geneva is strongly tilted towards the top 2 seeds as the seed cutoff is 61, and the rest of the field is pedestrian at best for this maiden tournament. On paper this is not a marquee matchup, and it may even be pushed to the secondary court but these two grinders have a split 1-1 h2h on clay and both have won challenger tournaments on the surface recently. Delbonis won Sarasota, though he has failed to qualify for both Madrid and Rome. Gabashvili has been on a tear on the challenger tour as he has won 10 straight matches, and consecutive challenger titles on two surfaces. The competition hasn’t been harsh, but he’s still showing some of his best tennis, as he also reached the quarters in Houston (upset Isner) and qualified for Istanbul. Fatigue should be a factor, and that’s the main reason as to why Delbonis would have the edge, but I’m going with Gabashvili to continue the positive momentum myself. Another fantastic opportunity for the young gun Russian to grab another ATP main draw win, the multi tool Rublev who has 4 ATP maindraw wins at just 17 has been given a wildcard and matched up against the veteran Nieminen, who doesn’t like clay that much. The Fin hasn’t won consecutive matches since January and he’s in the twilight of his career, thus I’m going with an upset and picking Rublev over the lefty. He’s played well under pressure this year and he’s proven he can compete at this level. Rome semifinalist Stan Wawrinka is the shining star on home soil at this tournament and he’s unlikely to have any trouble against Rendy Lu/qualifier in his first match. Lu has been playing hard court tennis in Asia, and thus should be jetlagged and unprepared, giving the qualifier a decided edge to advance. Wawrinka has struggled at times this year, but his form picked up in Rome and he should also be favored over Gabashvili/Delbonis, or perhaps Andreas Haider-Maurer who has put together a solid 2015 campaign thus far. AHM has a h2h win over Gabashvili and he has a semi a quarterfinal on clay this year. In my own bracket I have Wawrinka defeating AHM for a spot in the semis. Pablo Andujar will open with Carlos Berlocq or a qualifier, Berlocq is 2-1 against Andujar on clay, but he has lost three consecutive matches, Andujar made that shock run to the Barcelona final, but has done little else of note this season. I have Andujar into the quarters in a toss up match, and he’s likely to get an easy quarterfinal opponent as well, given all of the potential options are struggling right now. Joao Sousa should defeat his nearly named doppleganger Joao Souza, Souza has lost 6 straight matches while Sousa is a poor 4-6 on clay himself this spring. Austrian veteran Jurgen Melzer could suffer another bad loss to a qualifier in the other match in this section, Melzer has been in abysmal form, and thus I have Andujar reaching the semis over Sousa, though a qualifier has great odds at success in this poor quality section. Marin Cilic will open with the Nieminen/Rublev winner, the Croat is just 1-3 since reaching the Monte Carlo quarters, and Rublev could pull off a shocking result, still Cilic is the odds on favorite to reach the quarterfinals at least. Above the Cilic section is one of the weakest ATP quarters you will see on tour this year featuring Mikhail Youzhny as the seed, J.L Struff, Ricardas Berankis, and Santiago Giraldo. Youzhny is practically retired and is just 2-4 on European spring clay, Struff comes off one of his best results of a poor season with a semi in a clay challenger in Germany, Berankis is just 1-5 on spring Euro clay and Giraldo has lost three straight and continues to struggle this year. Nobody really deserves to reach a quarterfinal form this section, but I’m picking Struff to do so simply because he played well in Heilbronn. Giraldo should beat Berankis, and Struff should beat Youzhny, and then Struff should beat Giraldo, though Santi may have more upside. Even a rusty Cilic should dispatch Struff in the quarters. Albert Ramos is the favorite for the quarterfinals in the section above that, Ramos will face Marinko Matosevic first, and then the seed Benjamin Becker, both of whom are very poor on clay, and both of whom have lost more than 5 matches in a row. Ramos qualified in both Madrid and Monte Carlo, and he’s an actual dirtballer who hits with high spin. Thomaz Bellucci is the probable favorite to be the final quarterfinalist, though Janko Tipsarevic could sneak in on his comeback tour. The Serb will open with a struggling Denis Istomin and his .500 record since returning to tour after an absence of a year and a half is admirable. Presuming he’s getting better each tournament, we’ll see what happens in Geneva. Bellucci will open with Marcos Baghdatis who is poor on clay and he’s a tremendous 9-3 over his last three tournaments. Look for Bellucci to defeat Tipsarevic, and then Ramos and reach the semis. Ramos and Bellu has never played, and Tipsy and Bellu split meetings on clay in their previous h2h. A semifinal for Bellucci would be well deserved after his great efforts over the past month, he even took a set off of Novak Djokovic in Rome. Given Bellucci is probably the third favorite to win the tournament, if not the second, he’s the obvious choice for dark horse in Geneva. With a weak draw, that should feature a beatable semifinal opponent, be it Cilic or someone else the Brazilian could reach his sixth ATP final, and his first since 2012. He qualified in both Madrid and Rome, along with reaching the quarters in Istanbul as of late, and he took a set off Djokovic as mentioned, along with scoring a top 20 win over Roberto Bautista Agut in Rome. Wawrinka will be a tough opponent in the final, but I do have him getting that far this week. Wawrinka is 3-0 in the h2h against Andujar, with all of those wins coming on clay, and given his form perked up in Rome, there are fewer question marks about him going into this lower tier 250 event on home soil. The local hero should make the tournament, the fans, and his sponsors happy by reaching the final. Bellucci has been in better recent form than Cilic, and that’s why I’m picking him to reach the final. Wawrinka has previously lost to Bellucci on clay, and the prospect of losing again to him isn’t out of the question, that said, Stan was impressive in Rome, and he should be motivated to be the first champion of this tournament. He’s far from a lock, but still the above board favorite to capture this title going into Roland Garros.